These mini pies with a hint of Baileys are just the right size for one-person making them the ideal dessert after a dinner party. Grind the biscuits in a food processor until a gravel-like consistency. Pour in the melted butter and mix again. Divide the mixture between 6 small metal tart tins with removable bases. Press hard into each one. Put in the fridge for 10 minutes. Melt the chocolate in the microwave for 30 seconds at a time until melted. Alternatively melt it in a glass bowl suspended above a pot of gently simmering water. When melted, brush the inside of each case with the chocolate and put in the fridge for 10 minutes again. Remove the tarts from the fridge. Spoon 2 tablespoons of the caramel sauce into each one, top with slices of bananas and dollop 2-3 tablespoons of the cream over each. 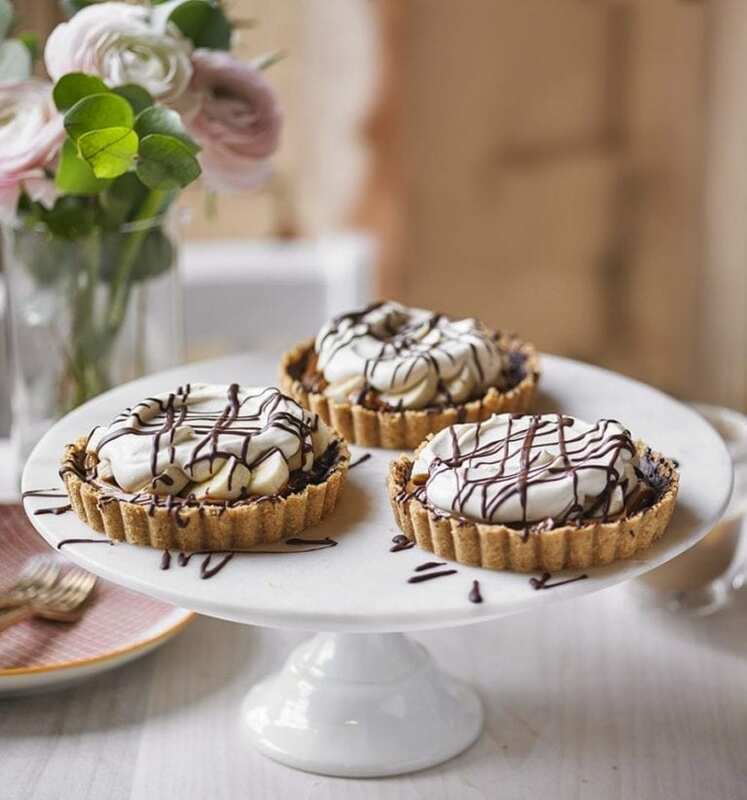 Put the remaining chocolate in a plastic food bag, snip the tip off with scissors so there is a small hole, then use to drizzle the chocolate over the top of each tart.